Bass drum dynamics are one of the most underrated elements of playing the drums. A lot of drummers have a tendency to focus way too much on the speed of their hands rather than improving the speed, power, and control of their bass drum. I believe that this is mainly because many teachers do not stress the importance of bass drum independence when they are first teaching their students how to play the drums. What I usually suggest to my students is that they totally immerse themselves in bass drum exercises for a period of a week or more. If you’ve been drumming for more than a year without focusing on your bass drum at all, try immersing yourself in bass drum exercises for the next three weeks. Decide and make a commitment that every time you go to practice the drums, you will create creative bass drum beats. Just keep simple beats with your hands and let the bass drum create the feel for your beat. Once you have worked on this for a couple weeks, go back and develop your hands and feet together. You will be amazed at the results! Using ankle weights to help develop your kick drum speed is a trick that very few drummers actually take the time to do. I’m not sure exactly why it isn’t talked about more in drum forums and communities, but using ankle weights has proven to be a very effective bass drumming training tool. Within just a couple weeks of using ankle weights you will notice a huge difference in your drumming abilities. Not only will you notice that you can play faster, but you will also have a much greater endurance. Practicing with ankle weights is a great way to start training up for a long summer tour, or just for building your drumming stamina overall. Heel Up Or Heel Down? This is a very widely discussed topic. When you play your bass drum, should you be playing it with your heel up, or should you be playing your bass drum with your heel down? Many drummers find it easier to play with their heel up, just because that was the way they were first taught, and other drummers were taught to play with their heel down. Lets take a look at the advantages and disadvantages of each technique. When you play with your heel up, you can get a lot more brute force with each stroke, this allows you to make your kick sound really loud, and punchy. This is great for rock bands, or bands where you want the kick drum right at the front of the mix. Just like all the other voices on the drumkit, you will get a lot more tone out of your bass drum if you hit it harder, so if you want a very large sounding bass drum play with your heel up. If you want a quieter sounding bass drum, maybe you are playing jazz, or playing in a small venue, playing your bass drum with your heel down will be the best choice for this situation. It will offer less tone than playing heel-up but when you are playing quieter gigs, you don’t really need your kick at the front of the mix. The heel toe technique will enable you to play your bass drum faster than you ever thought possible. When this technique is practiced correctly, it will allow you to play faster, more dynamic, and for longer periods of time than you ever have in the past. The technique itself is quite simple and doesn’t take too long to develop. But once you have this in your “drummers toolbox” you will never look back. The explanation for the technique is rather complicated, but if you go to bassdrumsecrets.com, there is a DVD that will show you the technique, the theory behind it, and how to apply it, all with slow motion video. This easy to follow DVD training course will cost you less than a one hour drum lesson, and the information itself is priceless. Using all of these techniques in this article properly will help you stand out among all of the other drummers. The more tools that you have in your “drummer tool box” the better, these are the things that will make bands pick you over any other drummers that they may be auditioning. 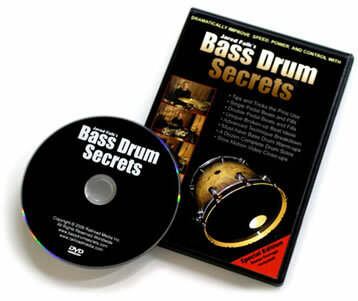 For more information, check out Jared Falk's Bass Drum Secrets training video. It covers the basic method, and it teaches you how to apply the technique in beats, fills, and drum solos. This instructional DVD is very detailed, and is priced fairly. You could probably pay upwards of a few hundred dollars for private lessons with a teacher that may not even be able to properly teach this method. Therefore, I would definitely recommend that you check out this option for best results. If you are interested in expanding your drumming horizon, you may want to consider learning how to play your drum rudiments. Learning your drum rudiments can make your drumming unstoppable! For a complete 'How to play drums' pack, you should check out Mike Michalkow's Drumming System! Along with bass drum techniques, this massive training solution teaches you how to play all 40 drum rudiments, drum theory, hand techniques, groove rock, jazz, latin, and much much more! Visit DrummingSystem.com for more information!